Depends how you define soon. WINNIPEG -- The seasonâ€™s first major dump of snow in southern Manitoba has made driving conditions dicey, with road crews in Winnipeg and across the province battling winterâ€™s blast. That frigidly cold large pool looks set to expand south across the US for Thanksgiving. A big start to winter across large swathes of the NH looks on the cards and suggestive of a locked in/repetitive pattern. That question about snow in PA -- would depend on what region, but that region will stay relatively mild until about Thursday then some snow is possible on Friday unless we're talking about the PHL (southeast PA) region where it is more likely to be a dry cold. The snow further west and north would be mostly lake-effect from Lake Erie and this usually dies out beyond the height of land in the Allegheny Mountains running through central PA. A few light flurries sometimes hold together almost to the east coast, but amounts are usually very light. But this pattern developing favours snow in the Great Lakes region and Ohio valley rather than the east coast, at least south of NYC, New England should do well this winter. The storm track will probably stay mostly north of a line from about Nashville TN to Baltimore MD and keep things relatively mild in Virginia and further south. In that pattern, PHL would be in the transition zone and get a few light to moderate snowfalls but nothing like last winter's mega-dumping through February. I do expect a more snowy end to winter for those regions as the cold expands towards mid-February. Havin my lunch and it is a fresh -26c outside...looks like it will dip below -30c tonight..before warming up later in the week. Out here on the coast it has dropped to -10 C and the wind is E-NE 20-30 mph (some places more like 35-50) and so the wind chill is about -23 C. Clear now, was cloudy most of yesterday. The snow we had a few days ago is still there on grassy surfaces but everything has frozen solid now, the roads and sidewalks are dry with bits of ice in a few spots. Snowstorm is developing down around Wyoming and heading for the upper Great Lakes region by Thursday. Meanwhile, it has been quite warm on the east coast, at least south of Boston, with the high on Monday 18 C at NYC, and heading for 20 C today in most of the major cities, with a cold front that will drop readings closer to normal on Wednesday, then back up again on Thursday when the western low arrives. On Friday, heavy snow squalls and much colder in the Great Lakes region, but this outbreak will only give a glancing blow to the northeast U.S. as it heads quickly east for the Maritime provinces instead. However, Friday will become very windy in the northeast with this thermal gradient very pronounced across upstate NY and New England -- could see temperature drops of 10-15 deg in three hours on Friday morning as this front arrives. Interesting reading reports from the Rockies, given I visited Banff and Vancouver in October this year, I know where places like Canmore look like and the terrain. Interestingly I seemed to visit Canada during a remarkable spell of late autumn warmth, my last day in Calgary on the 20th was greeted by blue sky and sunshine with maxima of 20 degrees!! it felt like a mid summers day. yes its been exceptionally cold across western canada and would not be surprised if some records were broken here for November..we are looking at windchill values close to -40c here by the end of the night with lows again below -30c. its that cold even though i have double glazing and the heating on full i still have a thick layer of ice on the inside of the windows!! That's amazing! The coldest I've ever experienced in the daytime was when I went to Scotland last December/January. Driving through Crianlarich on a crystal clear, sunny day (just after midday) the temperature was -11C. That was pretty interesting. 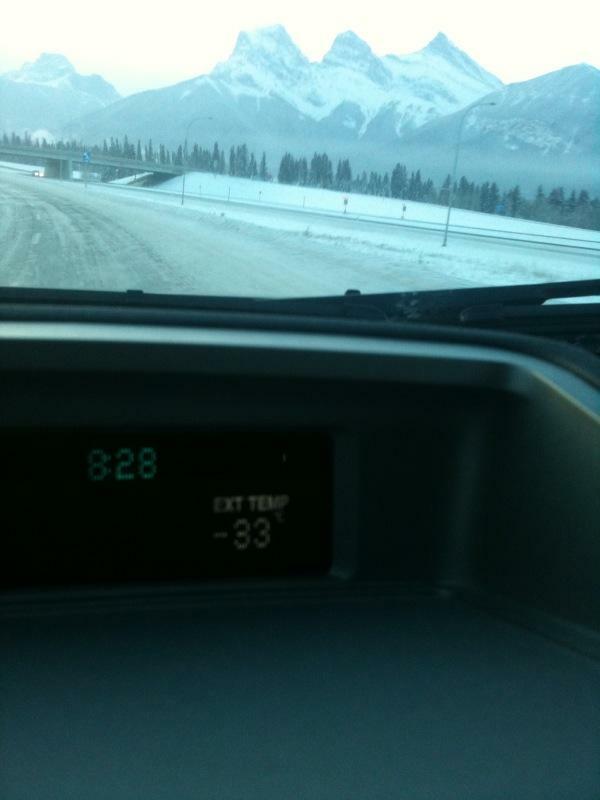 I don't think I can begin to imagine what -30C feels like with a -40C windchill...that's just insane! The temperature this morning was around -1C and that's cold enough for me!! We have about 5 cms of snow so far today in Vancouver and expecting 5-10 more before it changes to rain on Friday. Currently -1 C and the snow falling in small flakes like a fog almost, roads greasy but passable. The core of this arctic cold air has shifted south into Montana and Wyoming now, allowing a return flow and weak chinook to warm up most of Alberta to near freezing. It's very mild in Ohio and West Virginia today, 23 C at Charleston WV about 13 C above their normal. That very mild air has not quite reached the east coast but should before midnight to boost highs there to 15-17 C (currently sits at 10 C at DCA). Turning much colder across the Great Lakes region on Friday with the first big squalls of the year likely. Weather has been fairly non discript the last 2 weeks very quiet not too cold although it is only -16c today no snow no wind nothing really..hoping we might get some snowfall wednesday and thursday..then sunny and cold over the weekend..times like this i miss the ups and down of the British winter!! Heavy lake-effect snow from the Great Lakes past two days, London (Ontario) has had 50-100 cms locally, with road closures. There are a few other locations downwind from various lakes that got buried in similar depths, in upstate NY and parts of Ohio and Michigan. But it's confined to narrow bands of lake effect. Currently mild and raining here, about 10 C with a gusty SE wind. Gone pretty sedate here as well. After the late-November snow dumping (55.6 cm in little more than a week), there's been little of note to remark on. There's a fast-paced little clipper system passing through tonight and tomorrow, but it's not depositing a lot of snow here (maybe 3-7 cm with some gusty winds). Tomorrow's high is a positively balmy -1 C... but then the following day it's only -17, then -19, then -21. LOL. Who says we don't have ups and downs? I'm no doubt being very thick here cm but it's not obvious to me how you can get freezing rain in these conditions. Don't get me wrong I'm not for one moment questioning your post, just wondering what I'm missing and the precip. didn't fall as snow. Thinking about this I am being a bit thick. If that temp structure was just slightly different then the precipitation may originally have been of snow and just turning to rain. This would then hit the very cold layer and become supercooled and then bingo-freezing rain when it hits the surface. Time I stopped digging. London, Ontario apparently has had a 3 day snowstorm with depths ranging from 100cm to 150cm. Even I saw freezing rain at -8C on Christmas mornin last year! Just wondering if any of ye guys have ever been to Juneau in Alaska? It's my ideal place to emigrate to in a few years time when I'm finished with Uni. Looks like a stunning, picturesque little city. A couple of observations. Firstly I don't think the sounding I uploaded in response to cms original post was probably indicative of the atmosphere where the freezing rain was taking place. I suspect there must have been a deeper warmer layer above the very cold layer near the surface. Having said that the cold layer was fairly deep but the snow having turned to rain in the warm layer would the have supercooled in the cold layer with the effect that soon as it hit a cold surface it would instantly freeze as you observed with your windscreen. As you can see from 1998 ice storms can be devastating.